We at Chris Brown’s True Stewardship are celebrating one year on the air—260 episodes in the books! More importantly, though, we’re celebrating a year of hope and all of the amazing things our listeners have accomplished. That’s why I want to share a couple of stories with you. Well folks, we’ve made it. 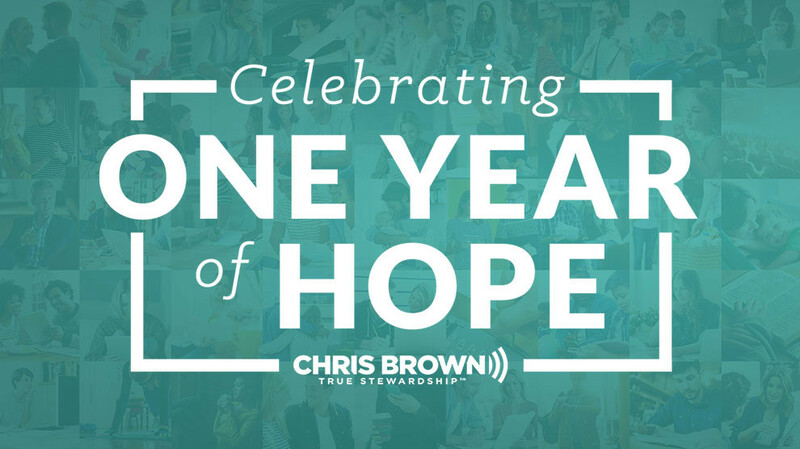 We at Chris Brown’s True Stewardship are celebrating one year on the air—260 episodes in the books! More importantly, though, we’re celebrating a year of hope and all of the amazing things our listeners have accomplished. This year, 1,200 people from around the country have called and emailed looking for hope. And some of them have contacted us to share some really amazing news! They’ve told us how God’s transformed their lives because they’ve put into practice everything our show is about: true biblical stewardship. People are living as managers of His blessings—not owners of their stuff—and it’s impacting lives! It’s hard for me to personally express just how awesome this journey has been. That’s why I want to share a couple of stories with you. These are the stories of real people who’ve emailed me to share how, with Christ’s help, they’ve changed their lives, and the lives of others, since they started listening. First, there’s Becky. Becky’s been a listener from day one, but she felt especially moved by the April 7 episode, where I talked with guest Steven Furtick. Steven is lead pastor of Elevation Church in Charlotte, North Carolina, and on the show, he talked about what it means to feel unqualified for God’s calling in your life. Talk about a feeling we can probably all identify with. I know that sometimes I feel that way! Well, Becky shared that after being laid off from her corporate job of 13 years, she was actually relieved. Her job had taken its toll on her, and she was struggling to juggle everything. Plus, she knew that this was probably God’s way of pushing her to fulfill her dream of starting her own business. But in a lot of ways, she felt unqualified to do that. Who was she to be an expert in her area? she thought. Steven’s message encouraged her to use the talents and passions God gave her to open her own small business—even though she felt unqualified. How awesome is that? There’s tremendous power in listening to God when He’s trying to tell us something and in honoring our talents and skills by putting them to use. That’s God’s intention, after all. He blesses us with our abilities. His plan is for us to steward those talents well by using them as He intended. Becky realized this after listening to Pastor Steven, and she stepped into the role God called her to. Remember, folks, that biblical stewardship carries over into all areas of our lives. It’s about more than managing God’s money—it means managing all His blessings His way for His glory. And those blessings include our talents. Sometimes, though, God uses financial stewardship to do really cool things in our lives. Another listener, who emailed but didn’t include his name, has managed his money well for his entire adult life. He’s tithed faithfully and is working toward paying off his home! Because of that, God has blessed him with a surplus, which he’s used to bless others. Isn’t that great? It’s so awesome to be reminded that the things we talk about every day on the show are having a real, concrete impact on the lives of people out there! Because listeners like you have been faithful with money, they’ve been able to share the love of Christ with others. What better testimony is there than that? Those are only two of the hundreds of emails we’ve received from people sharing their stories and testimonies. In just a year, so much good has happened. And it’s all because people are living their lives as stewards of God’s blessings. Here’s to a second year that’s just as fruitful as the first. Join me on the journey! Tune in to Chris Brown's True Stewardship today!